“The people denied today to exercise a democratic influence in referendums, parliamentary elections, and EU parliamentary elections include those who came to Sweden as refugees, who are spouses of Swedish citizens, or who immigrated to Sweden, for example, to study or work,” the motion adds. The party argues that giving non-citizens the same voting rights as citizens would “involve a greater sense of participation, togetherness, and increased self-esteem” among migrants currently ineligible to vote. Sweden is not the first country to seek to expand the franchise to refugees. Earlier this year, the Scottish National Party proposed giving both refugees and asylum seekers the right to vote in Scottish elections. “Scotland is a welcoming country and our intention to extend the opportunity to vote to all those legally resident in Scotland, whatever their place of birth, I think should extend to refugees and asylum seekers,” said SNP parliamentary business minister Joe Fitzpatrick. 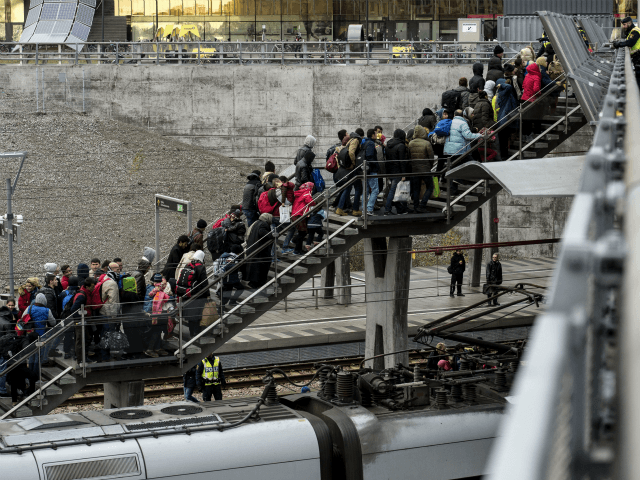 While Sweden has, in the last few years, seen large population growth due to mass migration and the arrivals of asylum seekers, some have pointed out how few minority MPs there are and how even fewer live in heavily migrant populated areas. The concept of demographic replacement has also become a concern for the populist Sweden Democrats (SD) with SD MP Richard Jomshof recently giving a speech in parliament warning that native Swedes were on their way to becoming a minority in their own country without changes to mass migration policies. Geez, are these folks really that foolish? On their website, the British Foreign Office writes that it has expanded their terrorist alert for Sweden “due to increased threats”. “Terrorists are very likely to try to carry out attacks in Sweden. Attacks could be indiscriminate, including in places visited by foreigners. Dag Evander at the Swedish Security Service (Säpo) confirms that they are aware of the change. We are aware that a change has been made, but we do not comment on what assessments other countries make. They have gone from one wording to another, but we cannot review their assessment. He says that Säpo’s assessment of the threat level in Sweden remains unchanged. It remains on an elevated level: level three on a five-level scale. Where it has been since autumn 2010. Of the Nordic countries, the UK has the highest alert of terror attacks in Sweden. For Iceland and Finland it is said that attacks cannot be ruled out, and for Norway and Denmark, terrorists are likely to carry out attacks. When it comes to Sweden, the UK Foreign Office believes that it is “very likely” that terrorist acts will be carried out. Very, or highly likely is level four on their five-level scale. For countries such as the United States, Russia, Egypt and Israel, the same wording as for Sweden is used. Abdir Isaak acquired a two-room flat in Biskopsgården in Gothenburg seven years ago. Not long after, his entire family moved from Somalia to Sweden. Now eleven people, of whom nine are children aged 2 to 19 years old, all living in the same flat. Abdir says they are looking for a bigger flat somewhere in Gothenburg, preferably with four or five rooms, but have not found anything yet. Stora hyresrätter är svårfunna i Göteborg. Därför bor Abdir Isaak, hans fru Seinab och deras nio barn i en tvåa sedan mer än fem år. Buying a home is out of question because both he and his wife are unemployed since at least six years back. The Moderate Party MP Hanif Bali recently commented on the family’s situation on Twitter. He questioned the fact that they despite overcrowding, still chose to have two more children. “Why have you continued to squeeze out offsprings during these six years, when you are unemployed, lack adequate housing and obvious common sense?”, he wondered. Bali also noted that after all, the family could afford a bigger flat, at least in the rental market. This thanks to the contributions that such a large family is entitled to – about SEK 40,000 (€4,000) – or SEK 50,000 (€5,000), if they manage to find a larger flat, according to Bali. In a report by Hem & Hyra, Abdir was asked whether he and his wife were hesitant to have more children. Yes, of course we were. But what happened happened nonetheless, he replied. A number of Jewish doctors at Karolinska University Hospital in Stockholm have been harassed and subjected to anti-Semitic taunts for several years. The harassment has, among other things, been in the form of reprisals against Jews in the hospital. A chief doctor is also accused of publishing anti-Semitic caricatures on Facebook. In 1933 in Hitler’s Germany, all Jewish-German doctors were registered on a special register. In 1938, all Jewish medical certificates were revoked, and many of those who had not yet fled the country left for Sweden. Some fifty medically trained and qualified refugees arrived in Sweden, others were rejected at the border. At first, the atmosphere was not quite so spiteful. Later, Jewish refugees were granted residence permits for only two or three months at a time. The management at Karolinska is said to have systematically ignored the problems. An investigation led by people with no experience on the topic was carried out. After that, they intended to establish a register of the Jewish personnel concerned – which is a serious breach of law in Sweden. The street next to the hospital is called Astrid Cleve’s Street. Astrid Cleve was a Nazi and Holocaust denier. The street of the Holocaust denier, next to the hospital that just created headlines by permitting harassment of Jewish doctors. New hospitals and new harassment's, but an old story. A story that should not live on, but be completed a long time ago. But a new verdict from the Migration Supreme Court now allows relief for family reunification. The case is about three Syrian citizens who according to the verdict have a right to be reunited with a fourth family member – a child who came to Sweden with other relatives in 2015, and was temporarily granted a residence permit under the temporary law. This implies relief in cases of family reunification that will probably affect many cases, says the Migration Agency’s Legal Director, Fredrik Beijer, on the ruling in a statement. We welcome the fact that this has now been tried by the Migration Supreme Court, which concluded that the family reunification ban violates the European Convention. The consequences of the new judgment will now be investigated by the Swedish Migration Agency. However, they can be extensive. “This judgement is important and may affect many people, so we will analyse it with priority,” he concludes. As expected, conservative Moderate Party leader Ulf Kristersson was not appointed PM at the voting on Wednesday in the Swedish Parliament. His party, as well as the Sweden Democrats and the Christian Democrats voted for, and all others voted against. Two middle parties, the Centre Party and the Liberals, voted against for the sole reason that they refuse to contribute to SD getting any influence whatsoever. The speaker Andreas Norlén then decided to give the Centre Party leader Annie Lööf the task of putting together a government. He estimates that the assignment can be carried out in one week. Lööf will thus report back to him next Thursday. Annie Lööf is the Bilderberg Group’s choice for PM. And recently, she raised George Soros to the skies in a post on Instagram. She was asked by a follower if she would comment on her meeting with the Globalist Bilderberg Group 2017, and her relationship with George Soros. “I have no personal relationship with Soros, but I would love to have one – a strong, brave person who has done and does a lot of good”. She further emphasised that she “would like to meet a person who, through his deed, raises important values ​​in our time”.